The Greeks and Romans were right; a pergola always makes pathways more inviting. 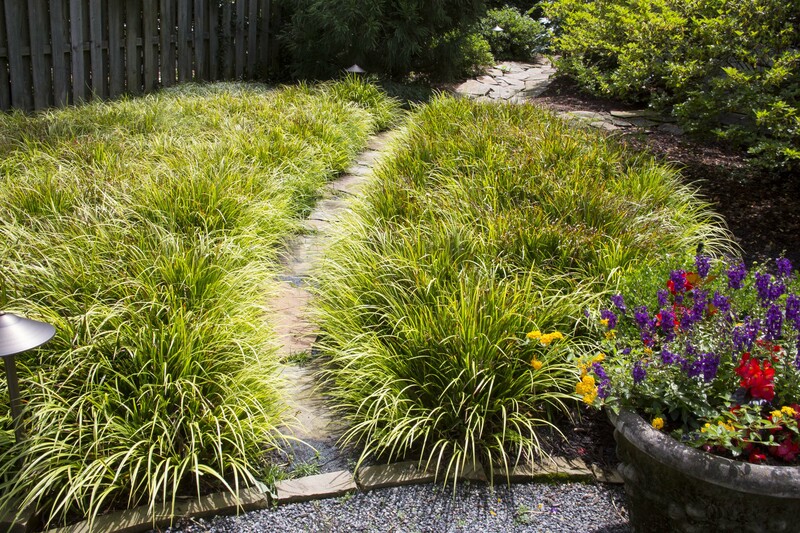 If you have a somewhat rectangular space and need a path, don’t just stop at flagstones or brick. Look up. Pergolas over walkways mean you can use vines and trailing specimens, and that you don’t block out the sun with anything heavy. Pergolas celebrate the seasons and provide vertical interest. Think about the pavers you use and remember to plant something between them for a cooling effect. 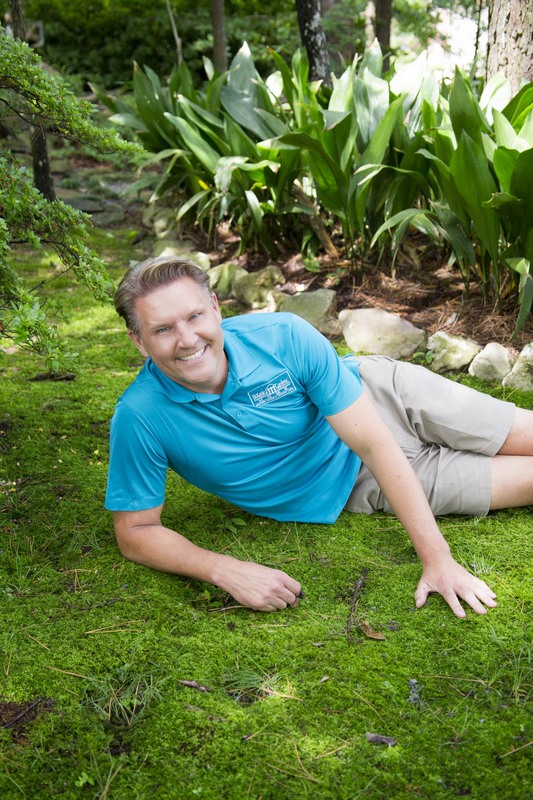 Mondo grass is used here between the pavers, but that scrumptious green in the foreground? 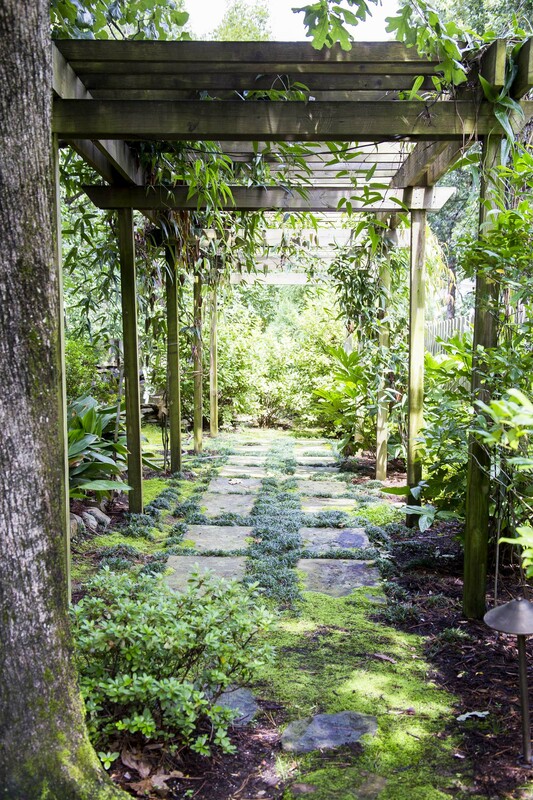 Moss, which is a great idea for shady areas that have just a bit of foot traffic. Zero maintenance, and almost neon in color after a rain. You can’t beat aspidistra for shade. There’s a reason it’s also known as ‘cast iron plant.’ It’s resilient, drought tolerant, spreads in a controllable way, adding depth and green glimmer to areas that couldn’t sustain plant material that needs sun. 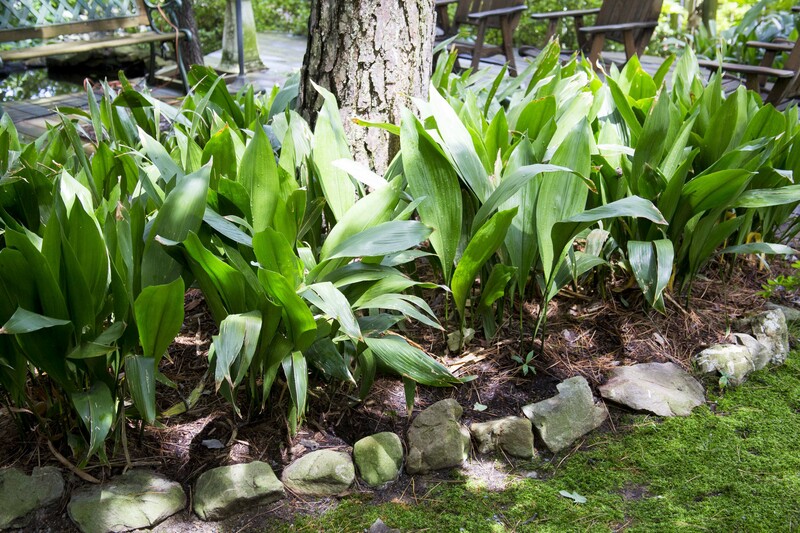 Most of us have spaces under trees or fences that don’t get light, what plantsmen term ‘deep shade.’ Aspidistra is the answer. In fact, aspidistra does best when it gets only a tiny bit of dappled sun, nothing more. It tends to be expensive because it’s slow getting started. But once it takes hold, you’ll have constant green because it doesn’t die back in winter. How inviting is moss? So inviting you’ll be tempted to lounge on it. Moss grows where grass won’t. Period. I wouldn’t use it in an area of constant foot traffic, but it’s great in those marginal spaces that don’t see a lot of activity. It likes water—of course—but needs little maintenance. If you have twigs and plant detritus that fall during a storm, you can clean your moss with a broom. Rakes are too strong for it. 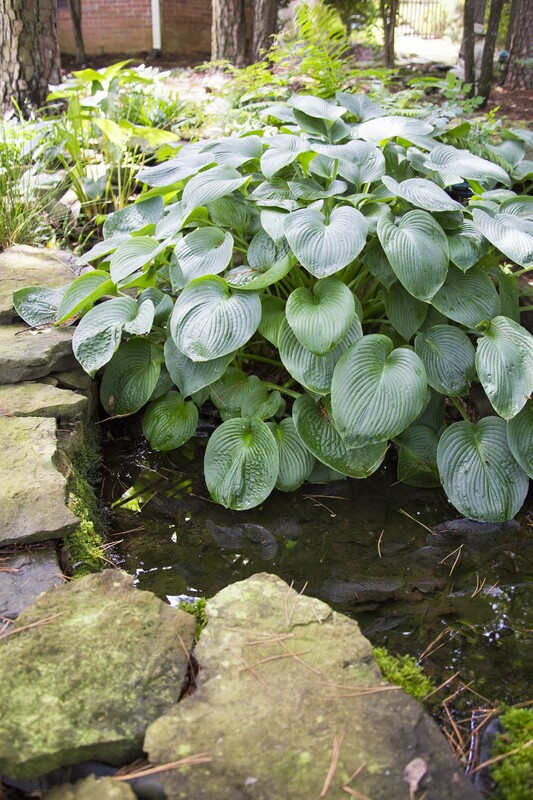 Hostas and water features are made for each other. 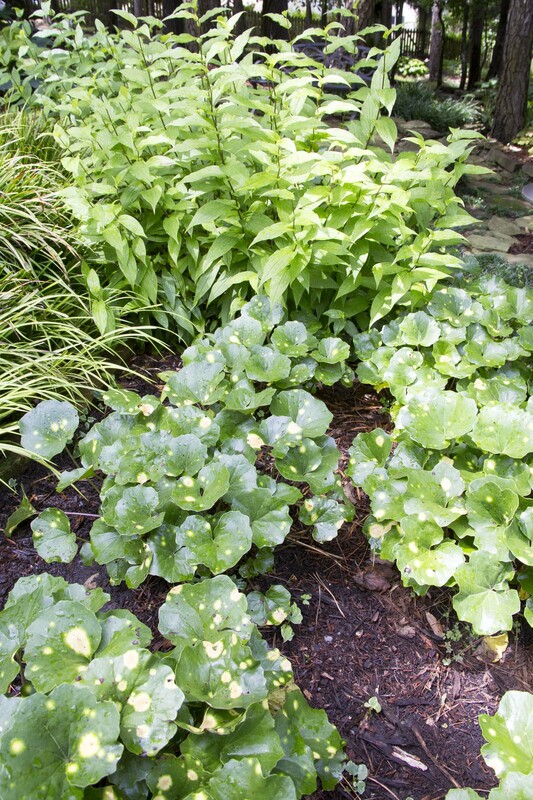 Once you get started with hostas, you’ll find yourself attracted to even more; more varieties appear on the market every year. They spread with ease and can be dainty or enormous. These two are Sums and Substance and Big Blue Daddy. When they have filled their space, just take a shovel and separate clumps. You’ll have lots in just a few years. You can’t beat flag grass for coverage and ability to adapt to most growing conditions. It likes sun, but will flourish in areas without a lot of light and even tolerates poor soil. The spiky uniform foliage always makes for good contrast with annual color and it’s perfect for edging around walks or borders. 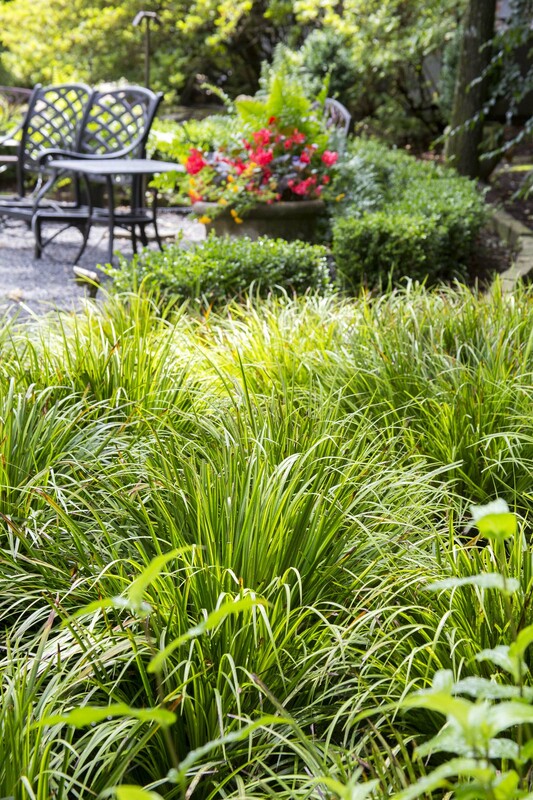 It doesn’t bully other plantings and you won’t find yourself clipping or separating clumps very often. This variety is called Lime, for obvious reasons. Looks exotic, doesn’t it? This pair, leopard ligualaria and toad lily behind, are actually good workhorses in the shade garden. They know their place, but adapt well and set in nicely. And the toad lily even has a small flower. They aren’t especially picky about soil, but do like moisture. Morning sun only. Your guests will stop and ask about them every time you lead a tour of your garden. And you can’t beat that variegated foliage of the ligualaria. That’s just a quick survey of what a shade garden can do. Yes, I know it can be hard thinking about green now when everywhere you look it’s gray and brown. But take heart; seasonal change is soon. And you’ll be thinking about shade and color and growth habits. Everything I have pictured here you can find at Botanica Gardens and Plantopia, and much more. 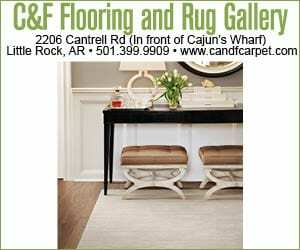 Come see us so we can help you go green. « Say “Hello” to Ultra Violet!